As we took off for the hunt, the burning sun penetrated our bodies and the red sand drenched in sunlight radiated heat from below. Our pace was slow and we walked quietly and carefully across the land, threading our path through shrubs and low trees and open spaces, catching some shade wherever we could. One of the Aboriginal women seemed to appear and disappear as she blended even in her colorful dress into the landscape. As she walked she held her palm open toward the ground as though she was waiting to sense or read the presence of the ants. I wondered, how she would know where to start digging since the ground beneath our feet seemed to repeat the same patterns of sand, shrub, trees and occasional anthills or termite mounts? Though quiet and often invisible to our eyes she took the lead for the hunt. The other two Aboriginal women were a mother-daughter pair. They were a bit more talkative and seemed quite keen for the hunt to turn out successfully for my friend and me. While I was a bit worried about the enormous amount of energy they spent searching and digging for honey ants I realized it was not my call to judge what was going on. 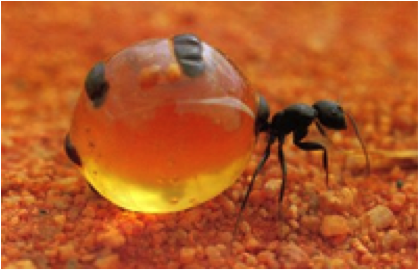 Over time it became clear to me how precious it was for them to be hunting for honey ants and to enjoy this real desert treat. Eventually there were indications for a honey ant site and the mother of the mother-daughter pair began clearing the space. The mother asked me to help and I removed the roots of a shrub that seemed to be in the way. Once this was done she molded a u shape into the sand with her hands, sat down cross-legged and began to dig. The seat she had created perfectly fitted her bottom. The joy of realizing what I had just seen traveled through my body like small lightening. The shape of the “u” she had crafted, looked from above like the Aboriginal symbol for person. This u-shaped symbol is found in many Aboriginal paintings, especially in those paintings that are done in pointillism style which capture landscapes from an aerial perspective. This u-shape is usually represented with some variations indicating if the person is a man or woman or child. A short line next to a u shape is usually a coolamon, a hollowed piece of wood for collecting bush tucker (bush foods), and the long line represents a digging stick. A u shape with a short line or a short and long line symbolizes a woman. A u shape with one or two long lines represents a man. One line is a symbol for a spear and two lines for a spear and a spear thrower. In the painting I made the placement of the Aboriginal symbol for women indicates the location of members of our hunting party at different times. During the hunt, at one point, the mother of the mother-daughter pair sat down next to me and drew the symbol for a honey ant site into the sand. The nests are shown in concentric circles and the straight lines indicate the underground tunnels between the nests. At the center of my painting I depict the symbol for honey ant sites. This is where we dug for the ants. 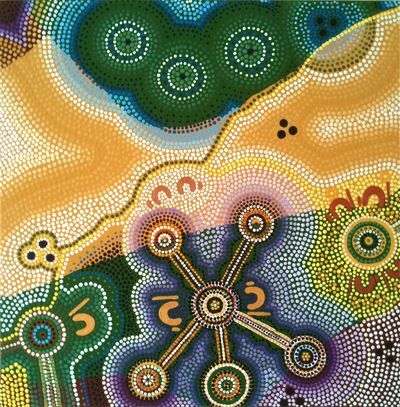 Aboriginal painting on canvas is a recent phenomenon. The Aboriginal art movement began in the 1960’s with its initial intention for the Aborigines to keep their culture alive. This movement later developed into a full-fledged art industry that spread across the country and in many ways remains the only way for Aborigines to participate in the western economic process. Papunya, a small community in Australia’s Northern Territory, is named after a honey ant creation story ‘Papunya Tula’ which means “honey ant dreaming”. This dreaming belongs to the various tribes who live there. This is where the Western Desert Art Movement began—several hundred kilometers north of where we were. Before the rise of the art movement Aborigines drew symbols in the sand as a kind of language to augment their verbal communication and stories. Many of the Aboriginal symbols that appear in paintings stem from these sand drawings. Other images originate from ancient cave paintings that until recently were maintained over the millennia by the Aboriginal tribes that were the traditional custodians of the cave paintings. Over the last two hundred or more years, Aboriginal peoples across the country were removed from their traditional lands and today most still don’t have access to their sacred sites such as these caves. In many ways these sacred sites are to them what schools, churches and hospitals are to us. These are the places where their story and knowledge is stored, where they performed ceremony and connected with their ancestor spirits. These are the places where they healed themselves and their community and told their stories and taught their children. With little or no access to these sacred sites they lost access to a significant portion of thier traditional culture. The Aboriginal women we were with were more fortunate. They are recognized as the traditional owners of their land and they have access to their land—though usually they still have to travel great distances to get there. Inviting women from outside their culture to partake in their traditional practices raises funds for their travel and livelihoods; they can thus afford to come together in ceremony. Many of the women I met as part of the ceremonies touched my heart. This is particularly true for the mother of the mother/daughter pair who shared so much with us while hunting for honey ants. When I first arrived at the camp she had frightened me a bit. She is deaf and uses a variety of sounds and exaggerated gestures to communicate. Her face is somewhat disfigured. She is an unusually tall woman—like me—and fairly close to my age. As I got to know her, my apprehensions dissolved and during the honey ant hunt the door opened to a much deeper connection. Using our respective ‘languages’, we communicated about a number of things. What took me by surprise is that she seemed to know important and very private facts about my past. While I cannot be sure about what she truly knew, what is still with me is sense of being gently exposed and facing a kind of truth about myself. There was also something I knew about her, however this I was told in camp. A year prior or so she had been significantly bashed up by a mob of men, which among other things had scared her face. This happened after she stayed behind overnight to look after a broken down car on some desert road rather than leaving with the others to get help. While we sat under the trees she reached for a small purse that she had carried with her and pulled out a small card and showed it to me. It said something like Women’s Council, Protecting Women and Children…. and the contact information. She also pulled out her mobile phone signaling to me that she can call them when in need. She rubbed the card on her chest and gesturing in a number of ways how glad she is to have access to this Women’s Council. Looking into her eyes beyond her scars and the groans of her unique language, I connected with her essence, her deeper beauty, her hope, her pain and her strengths, and with this I connected to the plight of so many women. I felt devastated about her story and deeply grateful for the Women’s Councils and the help they provide for women that have been hurt. Eventually we found several dozens of honey ants and I was given some to try. I carefully picked up one of the ants and held the bladder filled with sweet liquid on my tongue. I gave it a light squeeze with my lips and the liquid burst into my mouth. The taste was delicious! Th e flavor is reminiscent of ginseng honey and molasses. I placed the ant back onto the ground. Later I found out, if you do this carefully, the aunt continues to live and continues to make more of this sweet liquid. The daughter had patiently waited for hours and finally she got to have her turn to enjoy this special treat. Pleased, her face lit up with the sunniest smile. It was clear that there was no substitute for honey ants. The long wait was very worthwhile. Then we headed back to camp, filled up our water bottles and rested under some shade. This post was originally published in my blog Liminal Songlines. The intention of that blog was to help capture my initial understanding of the spiritual healing traditions of the Aboriginal peoples of Australia while I lived in Australia from 2009 to 2012. Much of what I learned is relevant to my continuing explorations of rites of passages in indigenous and contemporary cultures, the concept of liminality, and working with change in our turbulent times.